Concrete curb construction using slipforms can provide several benefits and a better finished project. Concrete curb construction during the last century was made by hand and with a slow-finishing process. 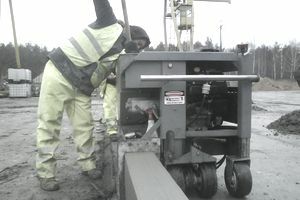 Nowadays, techniques have improved; slipform machines have become faster and more reliable producing a better-looking concrete curb. Adds strength and stability to the pavement, as it creates a rigid borderline structure along the edge. Minimizes deflection of the pavement surface. Concrete curbs strengthen the pavement surface. It confines flexible pavement and improves sub-base compaction. Concrete curbs maintain the pavement edge's integrity. It reduces the space needed when ROW are being required. It eliminates drainage swales and flat side slopes. It reduces erosion and sediments going into storm sewer systems. Creates a visual border of the pavement, ideal for drivers at night. Concrete curb reduces the driveway length from the edge of the street. Straighter edges can be obtained when compared to regular forms. It is less dependent of the labor skill. Reduces steel or wood forms use and consumption. Will allow for a better sloped surface finishing. Reduces or eliminates the need for intermediate spacers or templates needed to achieve required slope. Water will flow better when compared to regular forms concrete curbs. Better production can be obtained. Less time consuming and more installation per day. Minimizes the uses of pre-cast sections. Reduces waste of concrete material since it is placed directly into the machine. Several radius measurements can be obtained. It minimizes settlement from individual curb placement. Some equipment is equipped with concrete vibrators helping with the consolidation and placement procedure. Some slipform machines are equipped with automatic finishing equipment, to insert dowel bars at joints. Slipform comes in a variety of sizes. This equipment can work on areas where grade elevations are different. Newer machines have built-in GPS operation. What is the speed or how fast can the equipment complete curbs? How fast can the curb machine move from one site to another? What is the minimum radius that the equipment can produce? What is I need to move it backwards? Will it work? What other features does the slipform machine can have? Good luck and remember to always ask for the warranty on the equipment and the appropriate training lesson.